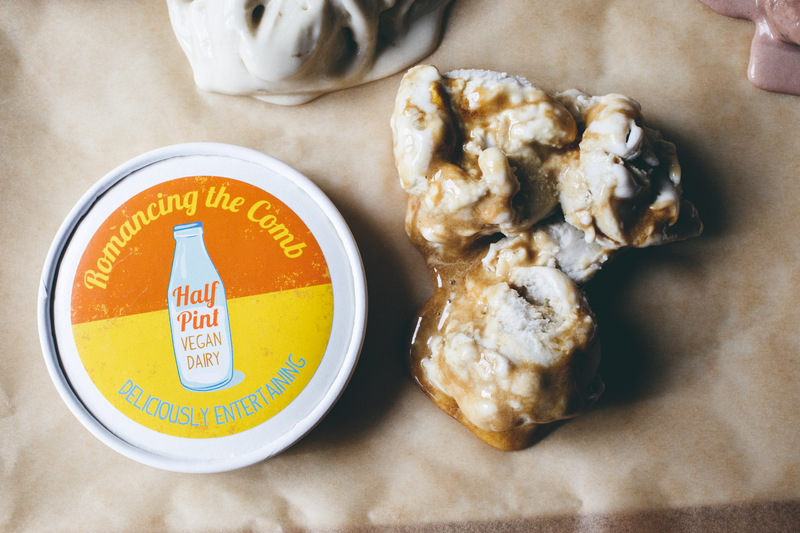 Halfpint Vegan Dairy are local Victoria-based producers of vegan, gluten-free, hand made coconut milk ice creams and buttery spreads. 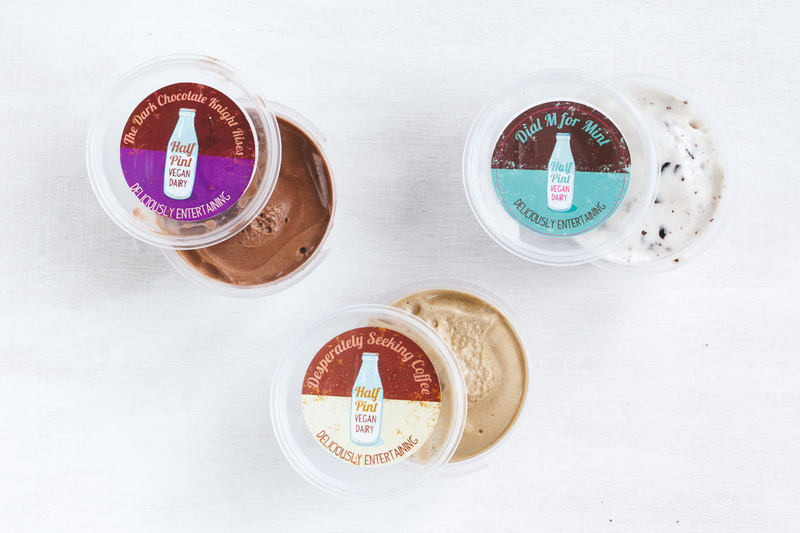 We had the opportunity to meet with one of the owners and sample a selection of their ice creams during our time in Melbourne and we instantly fell in love with their line of rich, decadent and indulgent vegan ice creams. Sam and Jules became vegans a few years ago and began making small batch vegan coconut milk ice creams and buttery spread to sell at local weekend markets. 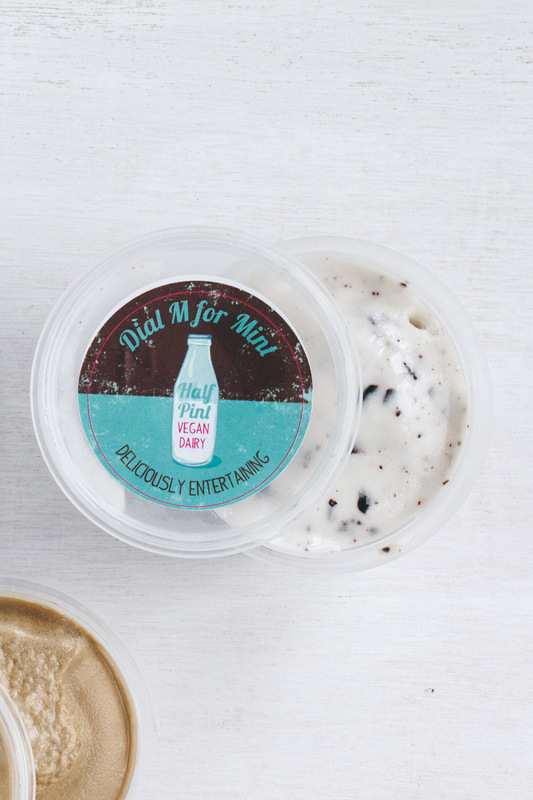 Sam is the passionate and talented cook behind Halfpint Vegan Dairy while Jules is the creative spark, and together their brand has a striking harmony of beautiful intentions and undeniably delicious foods. They are steadily adding stockists throughout Victoria and recently expanded to their first out of state stockist, The Vitamin Shop in Hobart, Tasmania. With belief, motivation and good intentions; Sam and Jules will continue to expand and make their mark on the dairy-free market in Australia. They still make the rounds at a variety of markets in and around Melbourne and sell a selection of sweet and savory bites, including pies, alongside their ice creams. Check their Facebook for updates on where you can find them. And as if we didn’t love them enough already, Halfpint also donates one dollar to Edgar’s Mission for every tub of A Beautiful Mud sold. Edgar’s Mission is a non-profit Australian farm sanctuary in Lancefield, Victoria and home to over 300 rescued farm animals. What a wonderfully sweet contribution! 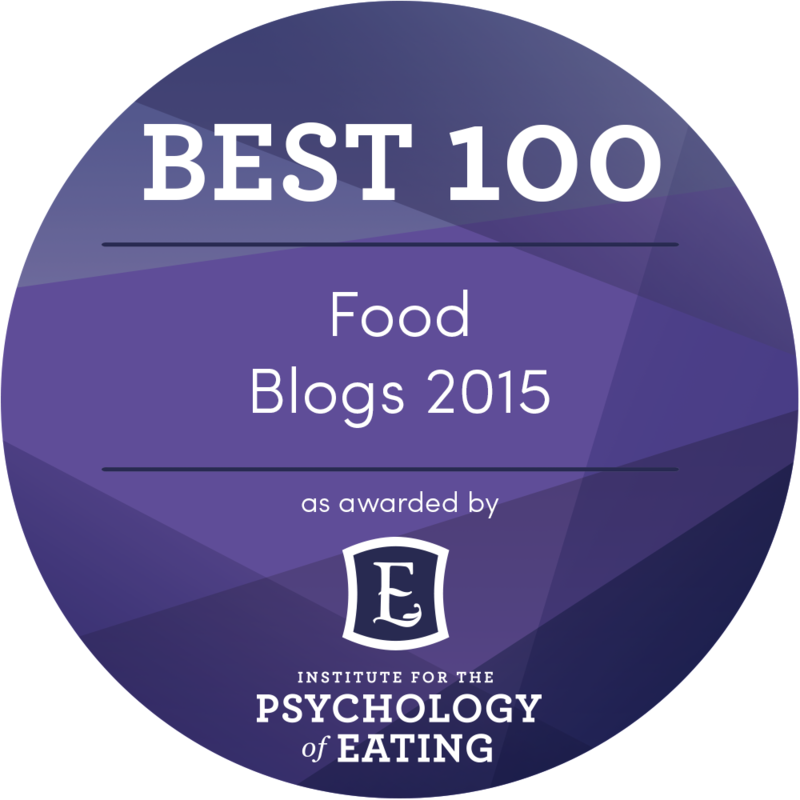 Please take a moment and check out their site. 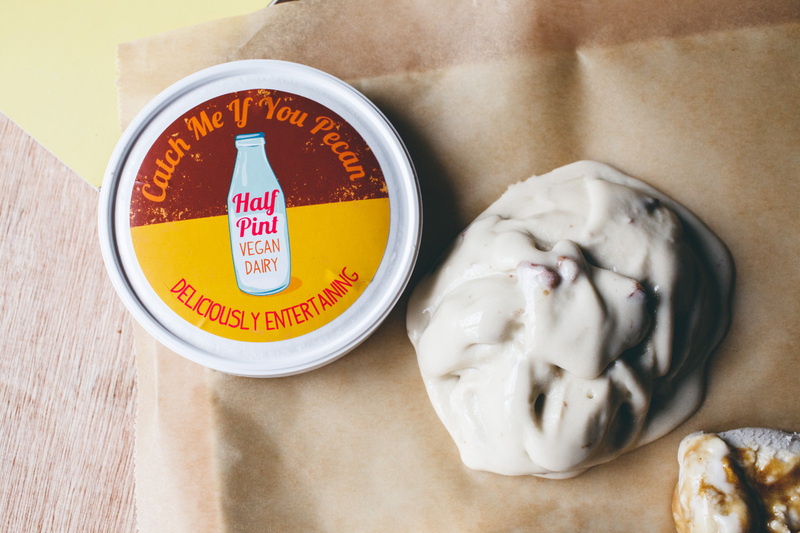 Halfpint Vegan Dairy is committed to making the most delicious and indulgent non dairy foods for the absolute pleasure of everyone who chooses ‘dairy free’! Deliciously Entertaining coconut milk ice creams and Australia’s first real butter alternative, Butter Me Up, brought to you by Jules Donovan, light comic relief; creative muse, and Sam Colligan, bloody genius; absolute marvel in the kitchen. Eat with joy and love in your heart, exercise, hug your animal. For other enquiries, please contact them at halfpintvegandairy@gmail.com. Please check their current list here, here and on their Facebook page. Playful, fun and creative. 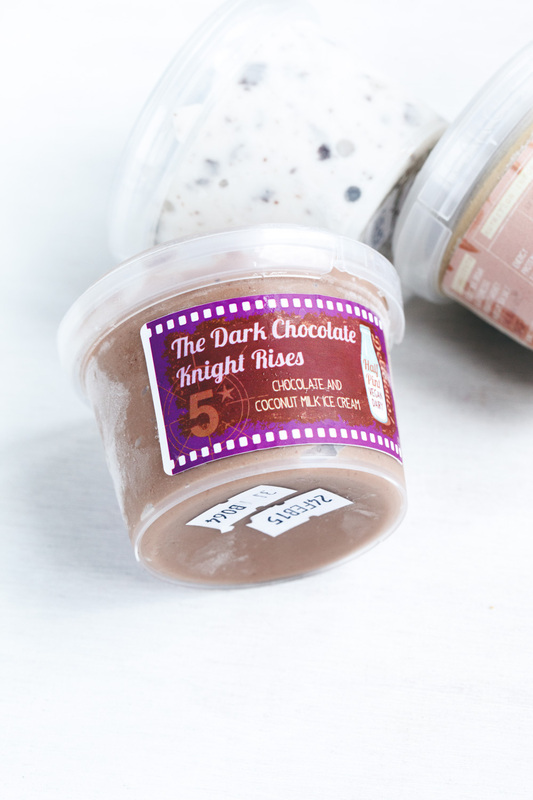 Drawing from their love of cinema, Halfpint have named their ice creams after classic films to help create an approachable, fun and familiar branding. Check out their stockists page: in Victoria (Melbourne) and Tasmania. They also make regular appearances at a few local weekend markets in the Melbourne area (check their Facebook page for updates). In the US, honeycomb isn’t so common so we were especially eager to try this honeycomb laced ice cream. Romancing the Comb is very sweet, dangerously good and was probably the softest of all the Halfpint ice creams we tried. If you allow the ice cream to thaw too much then the honeycomb starts to melt and becomes a bit like caramel. I personally love the honeycomb chunks, but even when it melts it’s still irresistibly delicious. This is Halfpint’s most popular flavor and we’ll just say that it was way too easy for us to finish. Ingredients: organic coconut milk, raw sugar, honeycomb (caster sugar, golden syrup, bi-carbonate soda), vanilla, arrowroot, carob gum and sea salt. This is the second most popular Halfpint flavor and was created to benefit Edgar’s Mission, a well-known farm animal sanctuary in Victoria. One dollar will be donated to Edgar’s Mission for each tub sold. 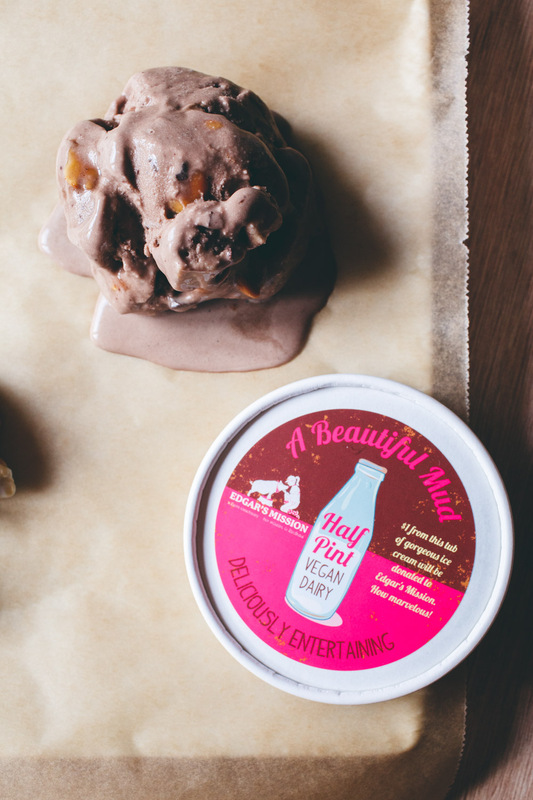 A Beautiful Mud is the perfect vegan alternative to Ben & Jerry’s. 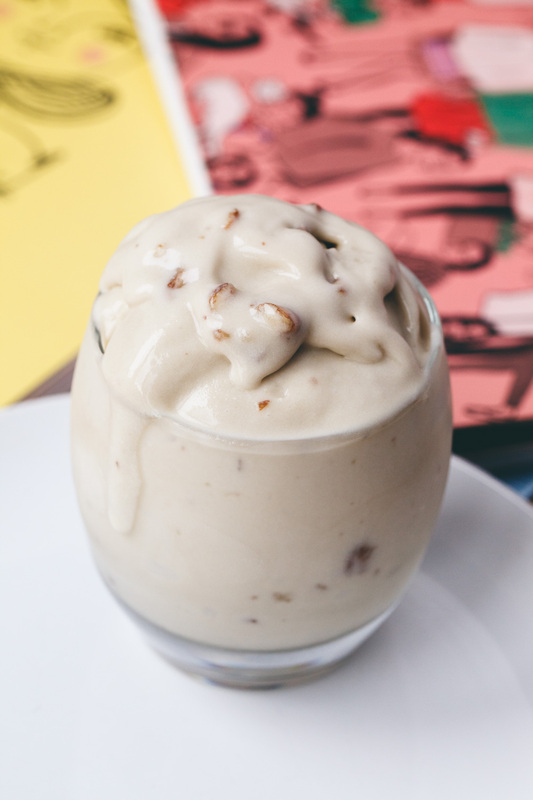 The combination of banana fudge (a bit like frozen candy bar chunks) and caramelized peanuts provides a combination of flavor and texture that make this one difficult to resist. I was surprised just how much I enjoyed this ice cream, in fact it’s probably the best store bought ice cream we’ve ever tried. A Beautiful Mud is thicker than Romancing the Comb and Catch Me If You Pecan and didn’t melt quite as quickly. Ingredients: organic coconut milk, raw sugar, peanuts, banana fudge (banana, coconut, peanut butter, rice malt syrup, vanilla), cocoa, chocolate flakes (70% cocoa solids, soy lecithin), arrowroot, carob gum, fair-trade vanilla extract, cinnamon and salt. Since this ice cream contains their Butter Me Up Original Dairy-Free Butter it has a distinctively sweet and salty flavor. 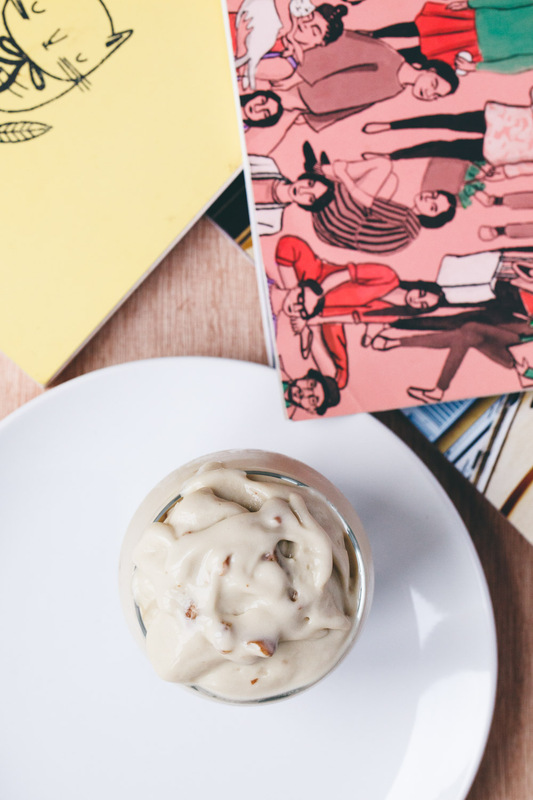 Catch Me If You Pecan is softer and creamier than the other flavors of Halfpint. 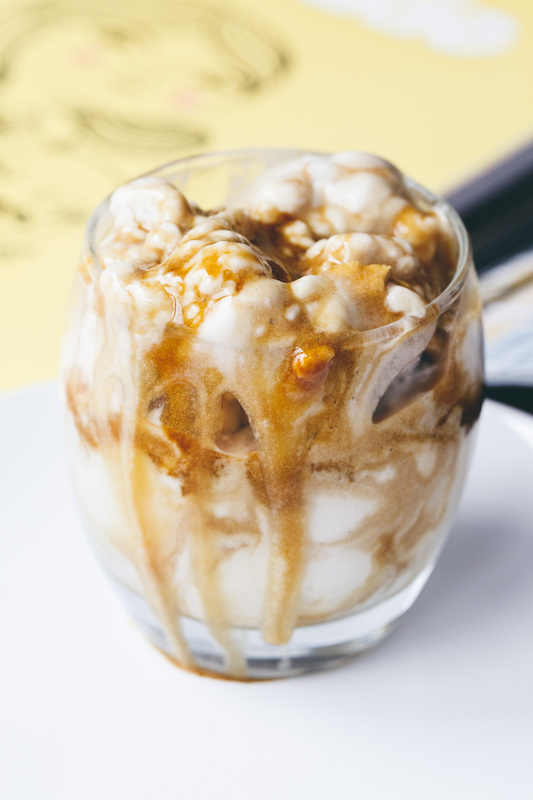 The salted caramel is certainly salty and gives this ice cream a unique profile that will appeal to anyone who loves salted caramel or other sweet and salty combos like kettle corn or buttered popcorn jelly beans. The buttered pecan pieces throughout provide texture, but they aren’t caramelized like the peanuts in A Beautiful Mud. Ingredients: organic coconut milk, raw brown sugar, buttery spread (coconut oil, soy milk, non-GMO, canola oil, soy lecithin, nutritional yeast, xanthan gum, turmeric, potassium sodium (202)), pecans, vanilla bean, arrowroot, carob gum and sea salt. Wow, this has a real After Eight, dinner mint, Andes chocolate sort of flavor. The mint is cool and refreshing and the ice cream has a soft serve consistency like Catch Me If You Pecan. I like Dial M For Mint as an after dinner palate cleanser and just one spoonful was usually enough for me. Ingredients: organic coconut milk, raw sugar, dark chocolate(min. 70% cocoa solids, soy lecithin), arrowroot, carob gum, sea salt and essential peppermint oil. I usually don’t like chocolate ice cream, but this one is so rich, creamy and chocolatey that I couldn’t help but love it. The Dark Chocolate Knight Rises has the flavor of real chocolate and is my recommendation for anyone who loves a classic. Ingredients: Coconut milk, brown sugar, dark chocolate (70% cocoa solids, soy lecithin), vanilla, arrowroot, carob gum and sea salt. There’s a touch of whiskey used and it helps to cut the bitterness of the coffee while also adding to the creaminess. 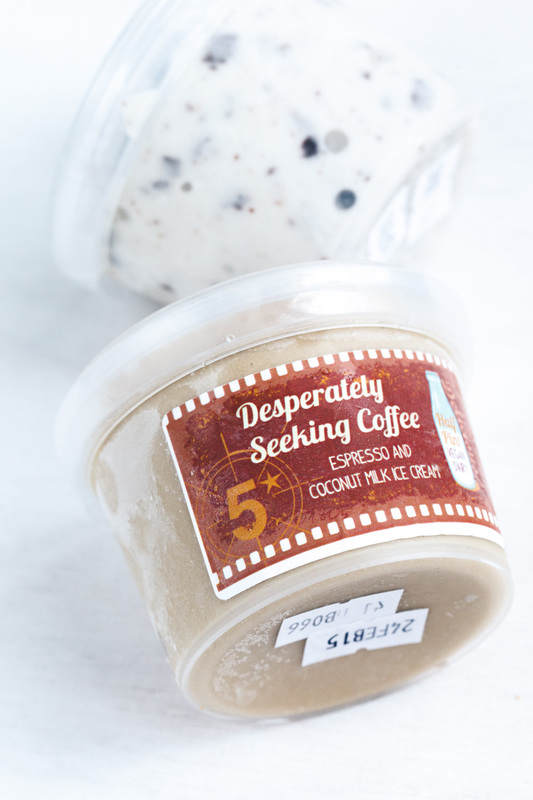 Perfect for the coffee lover but also sweet enough for even the light coffee drinker. Similar to Dial M For Mint, this one makes a great palate cleanser and satisfied my need for something a bit sweet after a meal. Ingredients: Coconut milk, brown sugar, espresso, arrowroot, whiskey, carob gum and sea salt.